In the 40 plus years I have collected western glass, I have been most attracted to the early stuff...The glass blown in San Francisco from 1860 until the early 1870s just calls to me with the beautiful colors, crudity and rarity. For many years, I had been trying to acquire a few problem free examples of the "champagne" style New Almaden Vichy water. It took decades, but I have two in my collection. These bottles are almost always seen with some form of damage...why? I understand that a Cassin's Grape Brandy Bitters would have a tough go at surviving being blown, packed, shipped, consumed, and thrown away. I get it...they are ornate and fragile pieces. Why in the heck are the New Almaden's almost always damaged? I am sure most diggers can relate to finding a killer western bottle in pieces, and the paper thin olive oils, and tons of blacks, champagnes, and slicks are perfect. Why then would a champagne style bottle ( which are always whole if unembossed), like the New Almaden be typically trashed, chipped, cracked or in shards? I can separate the inmaking stones and flashes from post manufacturing damage as being a part of the relatively unsophisticated western skillset of 12 year old boys making bottles, but my goodness these New Almaden's are rare! While certainly not figurals, the Vichy Water's are still a beautiful and significant part of California history. It seems like this bottle always creates more questions for me than answers. Why this style? Were they sold at the source or at resort? Were the contents different from the soda style and what about that funky "coke bottle" style of the extremely rare soda type examples? Also, are there any ads picturing the champagne pint, and quart plus size? What were the manufacturing dates of the champagne style? These bottles really remind me of the M.Keller California Wine Bitters in color, and glass character, I would bet they were made about the same time. I sound like a kid in the back seat on vacation. I have never claimed to be an expert in all of the history of all western glass, and I would appreciate some answers to the many questions I have on these great bottles. DM. As always, click on the photo to enlarge. Attached please find photos of a large litho in my collection. It dates to 1876. 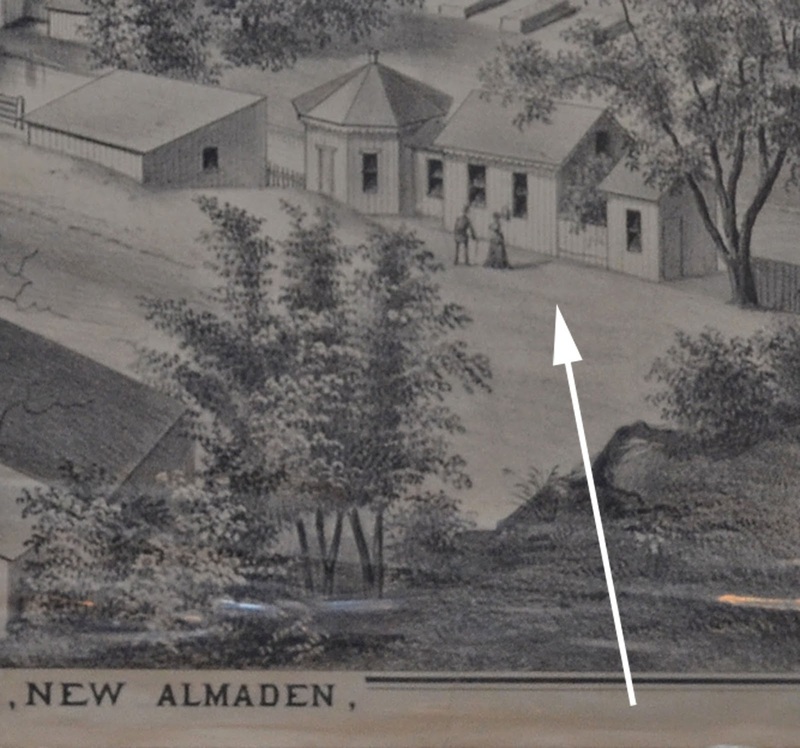 The buildings highlighted are the spring and bottling shed, which date to the aqua blob top era of New Almaden Soda Water. It is believed that Thomas and David Williams, in partnership with D.T. Winslow, took over the same springs from New Almaden Vichy Water some time after Francois Pioche's endeavor failed due to his death in 1872. They focused on the carbonation aspect, as opposed to the curative powers of the water and had a better run. However, their demise came about as well, due to a sudden loss of carbonation in the springs. To answer some of your questions, Mr. Pioche was the proprietor of the New Almaden Springs, with Mr. Chauvin as the agent for the New Almaden Vichy Water, which had its depot at the corner of Jackson and Montgomery Sts in San Francisco. This product was first marketed on May 29th, 1969 and continued to be advertised until August 4th, 1870. The bottles were first sold 12 for $4 with a buyback of .05¢ a piece. On August 25th, 1869, 24 half bottles for $5, with empties bought for .50¢ a dozen. By April 15th, 1870, the New Almaden Vichy Water was still only advertising two sizes of bottles, 12 bottles for $4 and 24 half bottles for $5. By July 1870 the price of the New Almaden Vichy Water bottles had been reduced to $3.25 per dozen for quarts and $2 per dozen for pints, with returned bottles being bought for .60¢ a dozen for quarts and .50¢ a dozen for pints. Probably lagging sales may have influenced the price adjustment, and advertising the return of their bottles may account for the condition issues found on many of the bottles. The quart and pint New Almaden Vichy Water bottles were definitely a product of the Pacific Glass Works. The San Francisco Glass Works was not in operation during the relatively short period these bottles were produced. Obviously I meant 1869, NOT 1969! I see Dale added an advertisement to his post. 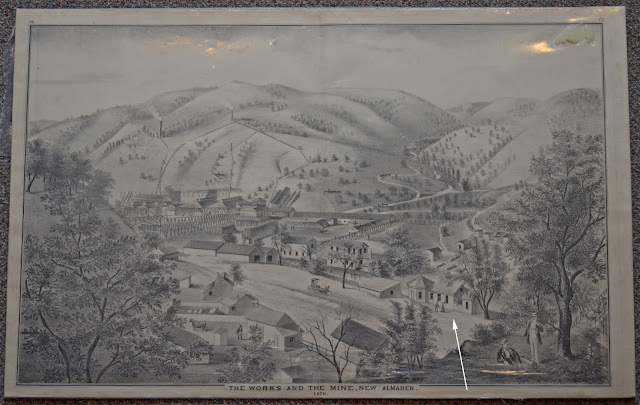 The first reference that I could locate for the New Almaden (California Vichy Water) business was in the May 29, 1869 edition of the Daily Alta California. I've forwarded a copy to you. The adv. was nearly a full column in the paper, is highly detailed and provides an insight into the chemical analysis of the water, as well as principals in the firm, and locations of both the main office and their "depot". He may have chose the bottle styles to resemble those used in his native France, where he got the inspiration for the Vichy Water. He was still deeply connected to France during his many business ventures out West. F.A. Pioche checked himself out with a Navy Colt revolver in May of 1872, That may have something to do with the short time these bottles were made. The deposit for the return of the bottles, also may have contributed to their rarity. It's kind of surprising that a large cache of these were not dug at the "used bottle dealer" site during the Big Dig ! Francois Pioche was financially ruined by the spring of 1872, due to one bad investment and failed business endeavor after another. Specifically, he was burned to the tune of about $75K by a French chemist who claimed to have found a new way "to reduce rebellious mining ore", $40K on the New Almaden Vichy Water business, roughly $100K on the Maxwell mine in Nevada, and up to $100K in the California Coal Company. There is also reference to the Willows Venture, although the amount of loss and type of scam isn't noted. The coup de gra was apparently the Volcano Ditch, which accounted for an additional loss of between $300K and $400K. Total estimated loss was roughly $715,000~. That's a lot of dough in 1872 dollars! Yep, the business end of that Colt probably looked pretty good about then.